The new Washman Semi Permanent Wash Pad is a sealed bund that will replace traditional concrete wash pads and can be fitted in less than an hour. A traditional concrete wash pad is costly and not always possible to install where the land is Leasehold. The Washman Wash Pad captures all the water into a 100 mm drain which can be discharged to foul or pumped to a water reclaim system. Typical installations are 2-3 year periods of use and the Wash Pad can be folded for transportation. The Washman water-tight floor has been further developed by Morclean alongside our European manufacturer in response to market demand, where an inflatable temporary solution is not the most effective method. When a car washing or vehicle washing business or company currently produces wastewater in one way or another, it has to be contained and possibly recycled or removed. Rather than build a permanent facility (which often requires substantial investments and is not always an economical solution) the WashMan semi permanent wash pad with fixed kerbs offers an alternative to this. The receptacle is semi portable and easy to install within hours of delivery. In addition, the receptacle can be supplied to meet your specifications in terms of dimensions, colour, design, etc. Unlike a traditional concrete structure which takes weeks to construct, the wash pad water capture system is installed quickly and with minimal disturbance to the ground. The wash pad is supplied with a drain to one end of the pad as standard or can be supplied as a complete water tight retainer. 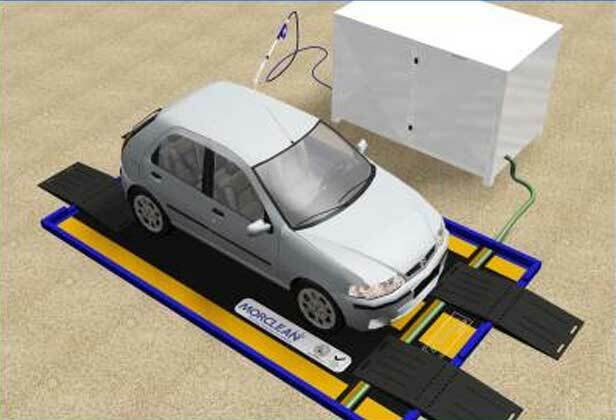 Simply roll out the semi permanent mat after delivery and use the fast fix bolts to fix to the floor (Morclean provide delivery and transportation using their internal transport). If using a drain and pump the floor needs to have a 100mm channel cut into the surface which causes minimal disturbance Then simply drive the vehicle on to the wash pad and you have a fully fitted wash pad at a fraction of the cost, disturbance and time. We can design and manufacture to any size using various colours. Commercial vehicles and cars generally fit onto a 3m wide floor, heavy goods vehicles are better using 4.5M wide floor but the wash pad can be specified in any practical size and dimension. The floor will not be damaged by the weight of the vehicle it is designed for, and a standard PVC wash pad will. This is a tested product, and has taken several years to develop. As well as the standard PVC coated polyester fabric (3063kg /sqm) we can make semi permanent wash pads in other coated materials, anti static coatings, high resistance coatings for excessive chemicals and various foil coatings. Although innovative and easy to operate the wash pads are more than just a simple construction. All wash pads have to be fully tested and we guarantee water tightness of the floor. All welded joints and connections are vacuum tested and inspected during a quality procedure. Every wash pad is given a unique registration number which is printed on the side of the floor to ensure identification of all the products used during construction.